For the last two installments of Fuzzball & Scuzzball, it seemed appropriate that Dale French and I, the two guys who created the characters, should both pitch in. So I drove down to Kentucky and we spent an enjoyable afternoon working on these. This page was a total collaboration. 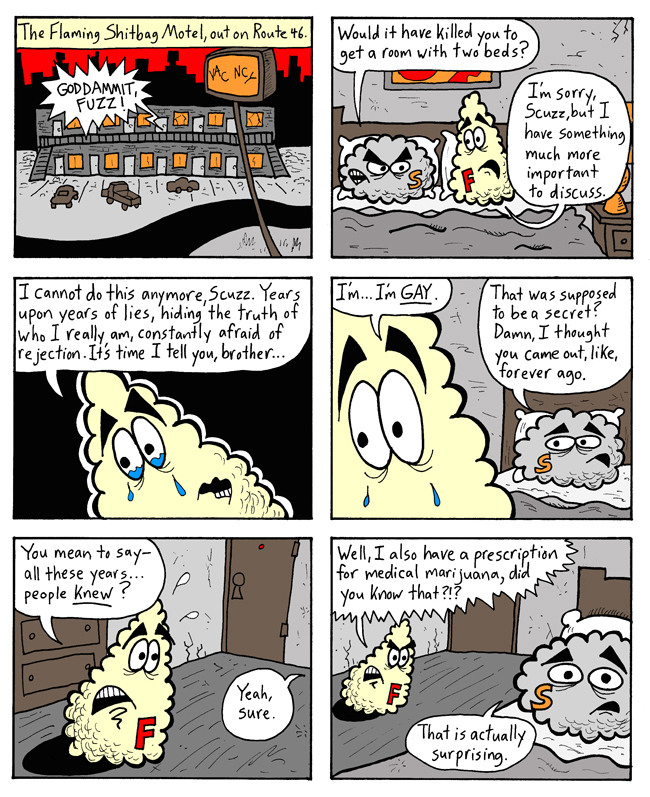 Based on the strip Dale had written a few weeks ago, that brought up Fuzzball's sexual orientation, I thought we should do a comic about Fuzzball finally coming out to Scuzzball. We talked it over and shared ideas, came up with a plan, and then I made a rough sketch of how we could break it down into panels. Dale penciled the panels and wrote the dialogue. Later, I inked his pencils and colored the page. So what you see here is a combination of both our efforts, blended together into something neither of us could have done on our own. It's been a long time since we collaborated that closely, but it all went smoothly, and we had a lot of fun doing it. NEXT WEEK: The final episode.